Occasionally, a B-Stock Buyer is issued an account credit by B-Stock; you might have a B-Stock Balance as a result of this. Now you have the ability to easily see your B-Stock Balance and apply it to unpaid orders! You will also be able to see details for the reason you have a B-Stock Balance, the amount and when it was issued. On your My Orders and Order Details pages, you will now see a Show My B-Stock Balance button. Click the Show My B-Stock Balance button; if you have a B-Stock Balance, the amount of your balance will be calculated and displayed. 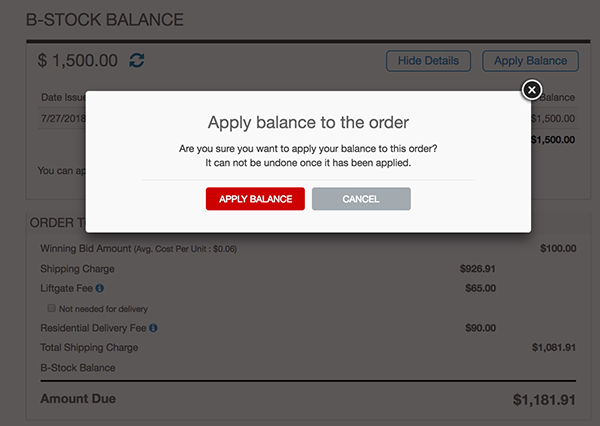 You will see an Apply Balance button if you have a B-Stock Balance and your unpaid order is eligible for payment using your balance. After you select Apply Balance and B-Stock has successfully processed the payment, any remaining B-Stock Balance will be updated in real-time. Once any portion of your balance has been applied, it can not be undone. To apply any remaining balance to another unpaid order, navigate to the Order Details page for the next order that you want to pay. Again, click the Show My B-Stock Balance button to display your updated balance. 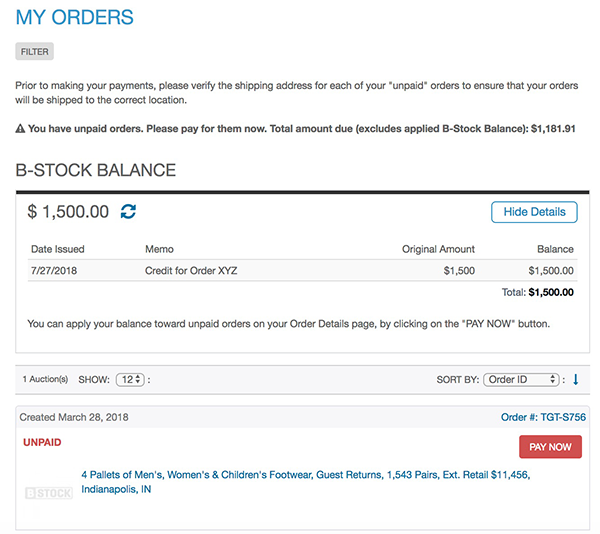 If the order is eligible for payment with your remaining B-Stock Balance, you will see the Apply Balance button. 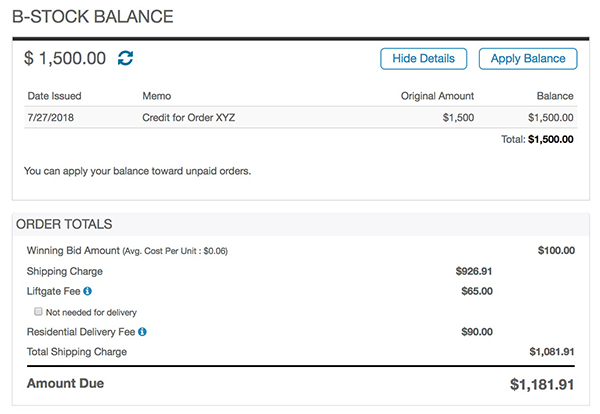 Click the Apply Balance button to apply your balance and view the updated order total. A B-Stock Balance can only be applied in whole amounts. If you have $1000 in your B-Stock Balance and an unpaid order for $500 that you’d like to pay for with your balance, you do not have the option to apply any amount of your balance less than $500. If you select Apply Balance for the order, B-Stock will apply $500 from your balance, leaving you with a $500 remaining balance. If you have a B-Stock Balance of $1000 and an unpaid order of $5000, you can select Apply Balance and B-Stock will apply your full balance to the order. The unpaid amount due for that order will be updated to $4000, payable via the standard wire payment to B-Stock. You may not see a Show My B-Stock Balance button for an order because that Seller has made a business decision not to enable order payments using B-Stock Balance. For additional questions about your B-Stock Balance, please Contact Us.